Never thought I'd see the mighty Dark Knight captured and beaten but when nefarious forces build an army of Batmen can even his Bat-family come to the rescue? That's the precarious situation James Tynion IV has put our hero in, and it's a tension-filled adventure with an unexpected rival faction that is formidable and believable. This may be one of Batman's greatest challenges yet. Tynion has tapped into a narrative that surprisingly hasn't been covered this way - the weaponization of the Batman-way. The Colony is an intricate network far more vast than our heroes realized but now know who's behind it and why. The issue combines some great political intrigue and conspiracy-driven action. Tim Drake shines using his tech skills and emergency preparedness. It seems each team member will get a chance in the spotlight to prove their worth as Batwoman and Tim have so far. Batwoman's relationship with her dad, Colonel Kane, makes her alliance with Batman a little complicated. Batman is still Batman, bad guys can't keep him down for long, and Tynion finds new ways to show off his ingenuity and determination. He then throws another wave of adversity Batman's way. This is what keeps both Batman and readers on their toes, the unexpected dangers that Tynion keeps inventing. It justifies the need for the team Batman personally recruited to hopefully come through for him. Alvaro Martinez and Raul Fernandez deliver some incredible pencil work. There is an abundance of detail and convey the speed and impact of action well. Martinez’s layouts flow smoothly providing a workable pace that builds to the dramatic end. Brad Anderson’s color work is dynamic and vibrant where needed. 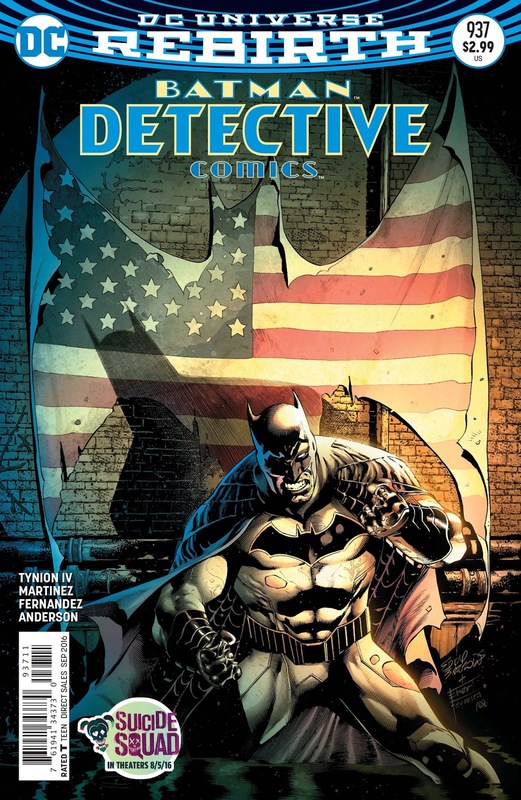 'Detective Comics' has become an addictive read for the simple fact you don't know what's going to happen next. Tynion, Martinez, and Fernandez are giving fans a reason to believe in this "Rebirth" with great challenging storytelling. It's high adventure as only a Batman series can provide.